Television programming is an ever changing medium. New shows, new times, new networks, networks renamed…it can be a vexing issue to providers and viewers. FPB Cable is taking the initiative to try and make the cable lineup easier to navigate and understand. “We want our cable lineup to make sense and the most logical way to do that is match up similar networks and programming within a particular genre where possible,” said John Higginbotham, FPB Cable-Telecom Superintendent. There are multiple reasons for the reorganization of the lineup. While FPB’s goal is to make it more viewer friendly, Higginbotham says some of the changes are mandated by networks. “Networks have very specific language in their contracts of where certain channels must be placed in a lineup. One of the reasons we decided to make a move of this magnitude, was because SPEED Channel is changing to FOX Sports 1 and that channel must be carried in our Classic Cable tier.” SPEED becomes FOX Sports 1 on August 17. FPB Classic Cable customers, that watch programming via QAM tuner, must rescan their TV to receive channel 80 and above AFTER 6:00am on Tuesday August 20. Click the images below to view the new lineup. The fourth image is the new lineup listed alphabetically. The fifth image is the new lineup listed by old channel numbers. Q. Why are we making the changes? A. Over the years, FPB Cable has had to make additions to the Classic Cable lineup. The only available slots were at the end of the channel lineup. As we have made these additions (and will be required to do so in the future), our channel order has and will become more and more disjointed. There are also technical advantages to making these changes which will allow our system to become more secure and free space for future additions. Q. If I have an FPB advanced set top or DTA what do I need to do in order to receive the new channel lineup? A. If you have an FPB advanced set top, your lineup will update automatically. It’s possible you might see a blank screen when turning on your TV the first time after the changes. If that happens, simply channel up and down and you should start seeing programming. If you have an FPB DTA, your set top should update automatically. Should you encounter problems, simply unplugging the power and plugging the power back in should fix them. Q. I don’t have an FPB advanced set top or DTA (I plug the cable directly into the television). What do I need to do in order to receive the new channel lineup? A. If you have a TV with only a QAM tuner, you will need to rescan your TV to see the new lineup. Every manufacturer’s equipment is slightly different, so we recommend finding your manual and looking up how to re-scan your digital tuner. If you can’t find your manual, try searching the internet for your TV model # and manual . If you still can’t find an answer, call us at 502-352-4372 and we’ll help you. Q. What was the thought process behind the new channel organization? A. Channels are now grouped by genre. 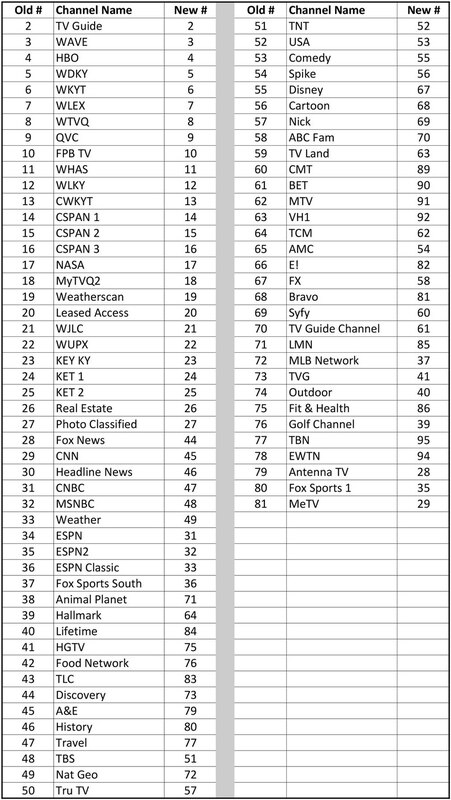 Sports, news, entertainment, and childrens’ networks are now consecutive in the lineup. Q. Why are some channel numbers missing? A. By leaving blank slots in the channel order, we hope to avoid further, similar changes in the foreseeable future. Q. Didn’t FPB just change the channel order? A. We haven’t made any significant changes to the channel order in 8 years. By leaving blank slots, we hope to refrain from making wholesale changes like this for a very long time. Q. Are any channels changing tiers? A. Antenna TV and MeTV are now available on Limited Cable. 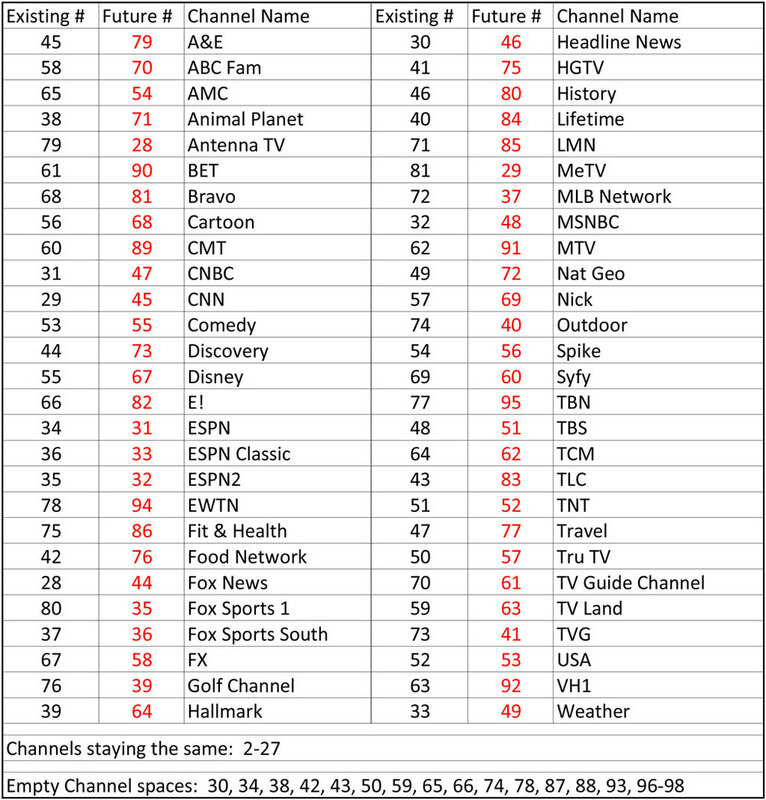 Speed Channel moved from Preferred Cable to Classic Cable on 8/1/13. It is being re-branded as Fox Sports 1 on 8/17/13. Q. Are there any changes to Preferred Cable, HD Plus and Premiums? A. 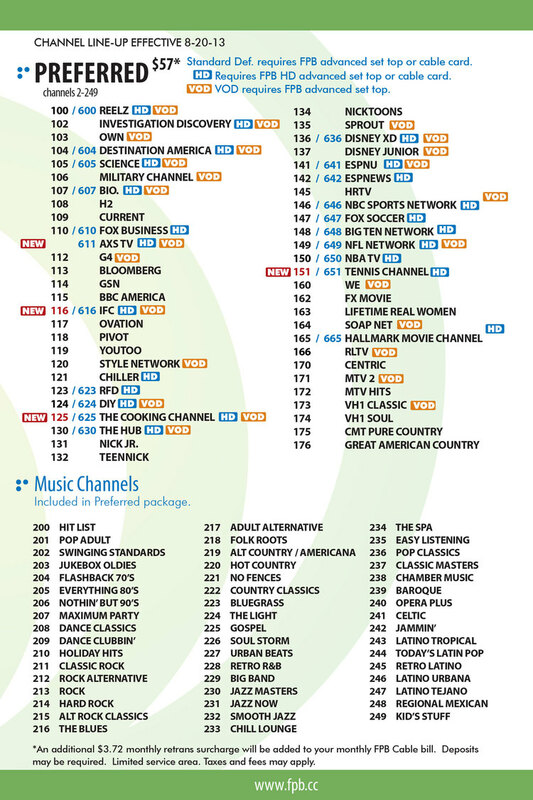 The only channel number changes are in Classic Cable. We are making the following additions to Preferred Cable: IFC will be on 116 and in HD on 616. Tennis Channel will be on 151 and in HD on 651. AXS TV will be available only in HD on 611. There will be two additions to the HD Plus tier: HDNet Movies on 777 and eScapes on 778. Q. What will happen to my future DVR recordings or series recordings I’ve set? A. If you set up Series recordings, Favorites List or single recordings by choosing a program in the interactive guide, all your recordings should be updated to the new channel numbers. The only issue you may have is if you scheduled a recording by manually selecting the start time, end time and channel number. We understand there might be some questions we haven't answered in the FAQ or on the video. Please take a minute to fill out the short form on the right and we'll do our best to get you an answer ASAP.